Lowering a home’s utility bills is never a bad thing. Neither is doing your part to conserve energy and protect the precious resource that our home’s plumbing provides. Below we will outline 6 tips you can take to cut down on daily water usage, and preserve the life of your homes plumbing system. 1) Drains need maintenance, never neglect them! For most home and business owners alike, drains are rarely given a thought until they become backed up or clogged. If you wait for this to happen rather than being proactive in preventing it from occuring you will likely need a professional plumber to remedy the situation for you. Believe it or not keeping drains running smoothly isn’t all that difficult assuming you perform some occassional maintenance. You’d be amazed what some baking soda & vinegar can do for your homes drain lines. Pouring a cup of each down your drains once a month can help clear hair, soap scum build up, grease, and other debris from the lines. Pro tip: never use over the counter chemicals to unclog a bocked pipe. They are not only harmful for the environment but can cause severe damage to the pipes in your home. The most frustrating part about dealing with water leaks is that most of the time they are not easily spotted. Locating hidden water leaks require expertise and equipment to locate that homeowners just don’t have. However, determining the presence of a leak is something any property owner can do. Closing all of the faucets in your home, and performing a “meter test” once or twice a year to ensure you do not have a hidden plumbing leak is a best practice for good homeowners. Standard toilets use a lot of water, there are no two ways about it. If your still have standards toilets installed in the restrooms in your home you should consider upgrading them. Fun fact: toilet usage accounts for around 30% of a homes water bill! By switching to water-saving toilets you will be able to drastically reduce your water consumption dramatically. Low flush toilets are a great option here. But in recent years many homeowners seem to prefer dual flush toilets. These are toilets that have 2 flushing options to reduce as much water waste as possible. One very low volume flush for urine, and another higher volume flush for solid waste. 1.3-1.5 gallons per flush is a good benchmark to aim for when shopping for new toilets. Also, be wary of toilets that run when not in use. A contantly running toilet is a toilet that is constantly wasting water & driving up your homes water bill! In addition to low-flow toilets, low-flow faucets are a great investment. The newest option for water saving taps are called “aerator faucets”. If you’re unfamiliar with exactly what an aerator faucet is, it’s a circular metal screen that covers a faucet head. The screen alters the flow of the water allowing for higher-pressure from a lower volume of flow. 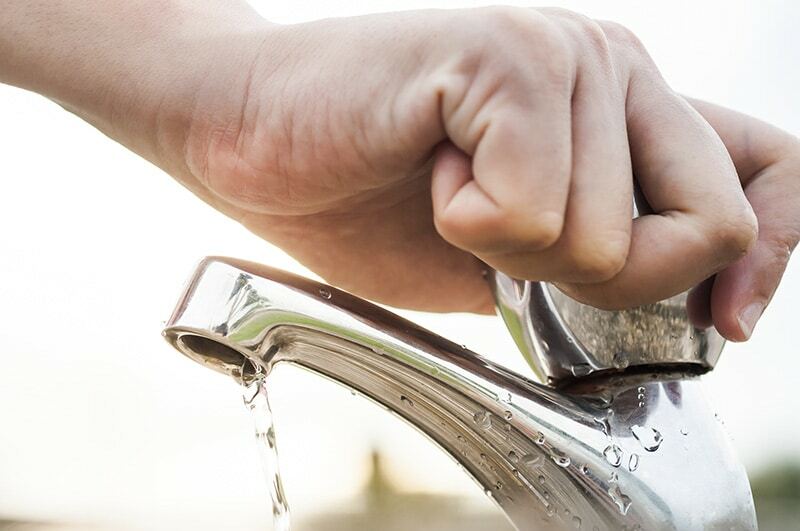 If the annoying sound of running or dripping water isn’t enough to drive you to make sure the taps in your home are closed when not in use, maybe the fact that upwards of 15 gallons of water per day can be lost from a dripping faucet, is! Aside from the money you are losing every year, the upwards of 5,000 gallons of water should be enough motivation to get dripping faucets in order. Just like faucets and toilets, the showerheads in your home should also be swapped out for low-flow options A low-flow showerhead consumes as low as 2.5-3 gallons of water in an entire minute! For comparison, a typical shower head uses somewhere between 4.5 and 6 gallons in that same timespan. Want to find a quick and easy way to save an additional 20k gallons of potable water every year? Upgrade those shower heads asap! Whether it be water flowing down drains while you brush your teeth or sprinklers running on rainy days, there are no shortage of ways to consciously conserve water. Simply try and find times where you can shut off the water when you’re not truly utilizing it. One pro-tip that serves two purposes is to literally shut off the water to your home when you are way traveling or on vacation. Not only will it guarantee that no unnecessary water is used, but it will also ensure that no plumbing accidents or flooding occur when you’re not home to put a stop to them.